The Michigan Marching Band made quite the impression on the home crowd this weekend with their tribute to John Williams and the upcoming Star Wars Episode 8 film. However, they didn't only salute Star Wars. They also featured the music of Jurassic Park and E.T. The show had a few moments that quickly spread like fire. The moment that really got fans excited was when 40+ T-Rexs came running out of the tunnel and acted like back up dancers to the performance. They also made the Millennium Falcon which caught the eye of many Star Wars fans across the country. The full show is available here and we highly encourage you to watch it. 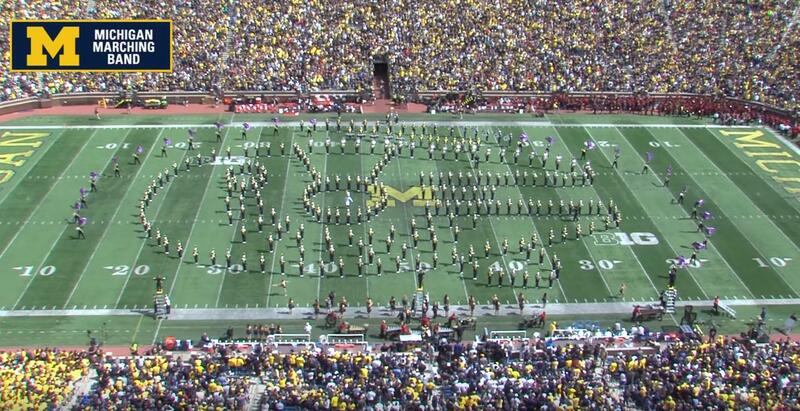 One of the things you'll always find with the Michigan Marching Band is a fantastic sound. The music is played beautifully in this performance and John Williams would be very proud if he saw it. Follow us @CollegeMarching on twitter, instagram, facebook and snapchat!